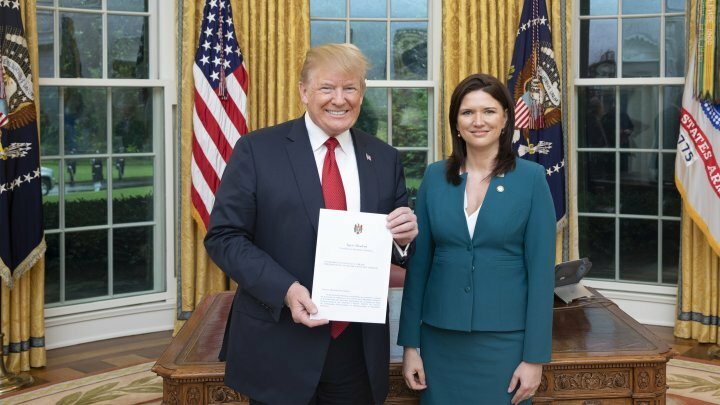 Cristina Balan has presented the letters of accreditation as the extraordinary and plenipotentiary ambassador of the Republic of Moldova to the President of the United States Donald J. Trump at an official ceremony at the White House. At the presentation of letters of accreditation to the US President, Ambassador Cristina Balan mentioned the importance of the Moldova-US Strategic Dialogue for the relations between the two countries and the importance of supporting the USA in the sphere of regional stability and security. Also, in the message to the US President, Ambassador Cristina Balan presented the priorities of her mandate with a focus on developing security cooperation, strengthening the economic and trade dimension, encouraging investment, enhancing energy security, and stepping up cooperation on education and innovation . For his part, President Donald Trump welcomed the friendly relations between the Republic of Moldova and the United States of America, reiterating the US's readiness to further assist the Republic of Moldova in implementing reforms aimed at the European integration of our country, and firm commitment in the process of solving Transnistrian conflict. President Donald Trump wished Ambassador Cristina Balan to be very successful in her mandate and recalled her administration's support for a prosperous European future for the Republic of Moldova and for carrying out democratic reforms in line with the commitments made under the EU-Moldova Association Agreement.